Welcome to the World of Tanks Wiki. Here you'll find detailed information on all of the tanks and other armored vehicles in World of Tanks. This wiki can help you become acquainted with the statistics, tactics, and general capabilities of the various tanks you own, plan to own, or encounter. In addition to the tank pages, you can find information about the equipment you can add to your tanks, skills your crew can learn, game mechanics, lingo, and more. World of Tanks is a team-based massively multiplayer online action game dedicated to armored warfare in the middle of the 20th century. 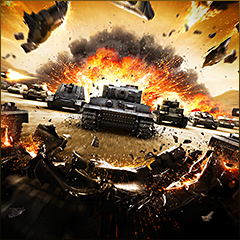 Throw yourself into epic tank battles with other tankers all over the world. Your arsenal includes more than 400 armored vehicles from America, the United Kingdom, Germany, France, the Soviet Union, China and Japan. For more information see the NA, EU or Asia servers' guides from Wargaming. Check out the Beginner's Guide and learn how to edit pages and make other contributions to the wiki. This page was last modified on 21 August 2018, at 07:25. This page has been accessed 8,045,763 times.